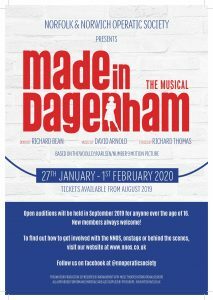 Made in Dagenham is drawn from the real-life 1968 sewing machinists strike at the Ford factory in Dagenham, Essex. This strike was influential in the passing of the Equal Pay Act of 1970. The musical focuses on the leader of the strike, Rita O’Grady, as she encourages the women of the Ford factory to walk out after they are re-classified as unskilled workers, while their male counterparts see their wages increase. To everyone at Sound Ideas for their opening night of Ghost - The musical, have a magical night!It's opening night for GHOST - The Musical at Epic Studios! Get ready to believe with us at our first performance, 7:30pm this evening! Online sales close at 6:15pm, but tickets available on the door. The curtain finally came down on our fabulous Guys and Dolls last night! Thank you to everyone who has been involved in this production, both on and off stage, to our director Chris Cuming for his vision for this show and to the wonderful team at Norwich Theatre Royal. And to everyone who came to watch, THANK YOU from us all at NNOS for being such a brilliant audience and for your fantastic support! ‪We have almost reached the end of a wonderful week at Norwich Theatre Royal with our Guys and Dolls and it’s a two show day! Last chance to enjoy this fabulous feel good show, so don’t miss out!